Lack of facts about the characters makes for pretty uninformed writing. Pattern color selection is not based on any actual knowledge of how bad or good a character is. As you know, all the good gals and guys have cool colored backgrounds…. whereas the bad ones have warm. But other than the fact that I quite fancy K-2SO’s design, I know nothing about our tall grey new friend. So a random pick of orange it is. And you guys, no spoilers in the comments! 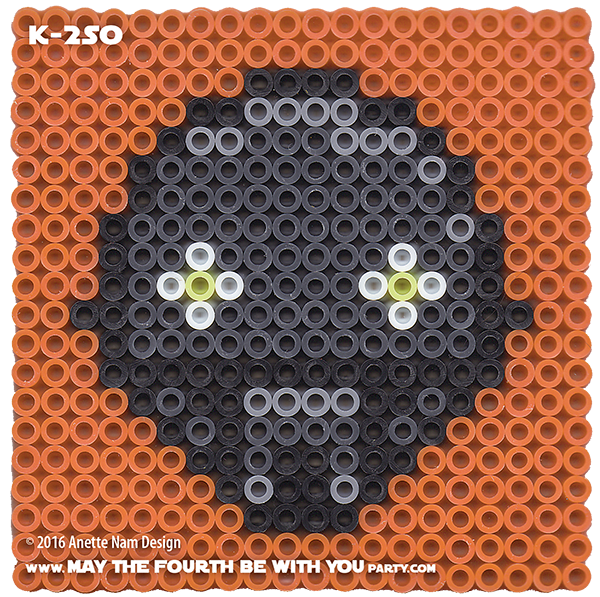 K-2SO is #71 in the Perler bead/cross stitch/crochet/knitting/Lego/pixel/mosaic pattern series. I am so thrilled you like them! And yes, they would make great Christmas Ornaments. What a great idea, I never thought of that! Now, I am really a cross-stitcher at heart (Before the kids, I made a lot of samplers), and I have it in my head to do a sampler for each of the trilogies (so 1, 2, 3 on one, and 4, 5, 6 on another). But that means I need many more ships! So I have about 20 ship patterns already made, and we will be posting those after the Rogue One patterns are all up.